Why Choose the “School Edition” and what does “School Edition” Really Mean? Ticket sales for our fall production of Les Miserables begin THIS FRIDAY! While the show is fairly well known, the school edition differs a bit from the original production. 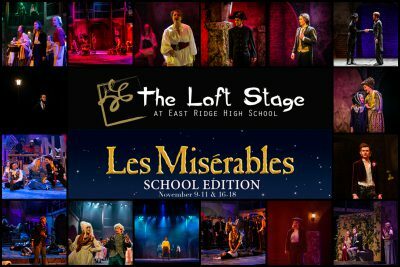 One of the many questions we received after selecting Les Miserables as our fall production was “why choose the ‘school edition?’” After perusing several scores we landed on Les Miserables as a rich and challenging text for both students and audiences alike. The only issue with doing this show this year is that the touring company of Les Mis will be in Minnesota within the same calendar year, restricting rights for the original production. If we wanted to continue pursuing this show, our only legal option was to apply for school edition rights; and after reviewing the differences between the two versions, we felt the story, characters, conflict, and score were still the right fit for our season. So the question remains, what does “school edition” actually mean? It’s first important to understand what “school edition” doesn’t mean (ie – censorship). Contrary to the connotation, the school edition of Les Mis does not sanitize language nor does it remove the mature situations on the battlefield or the docks. Instead, the school edition seeks to abridge a lengthy score by removing a few unnecessary musical interludes, namely the counterpoint section of “The Confrontation,” much of “Dog Eats Dog,” and the “Wedding Chorale.” Thankfully, many of the most iconic Les Mis moments are very much in tact in this version, we’ll just be able to end the show at a more reasonable hour! For families wondering appropriateness of content for young audiences, we definitely leave that decision up to the discretion of parents and guardians; however, the content and language would merit a PG-13 rating. If you have any specific questions about content, feel free to email director Kajsa Jones (kjones@theloftstage.org). Please complete the following tech interest form so that we know what you are interested in doing once we start assigning crew roles. Please note that only performance crew positions are assigned and production crews are open to anyone who has registered and would like to join. The Loft Stage is seeking energetic performers ages 4th-8th grade. 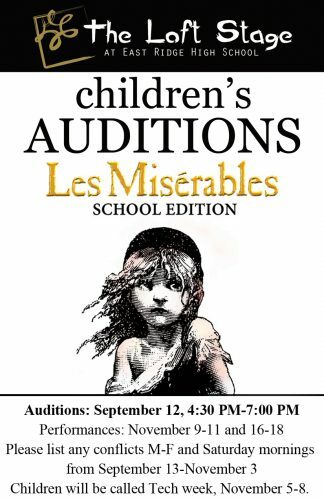 We are looking to cast Young Cosette (F), Young Eponine (F), and Gavroche (M). Please prepare a song from the show, either “Castle on a Cloud” (female) or “Little People” (male). Sheet music is attached and accompaniment will be provided. Auditions will take place in the East Ridge High School Choir Room.